Here is how I configured access.log, ssl_request.log and error.log to rotate at midnight every day. Put this below script in a file named rotateall.cmd and schedule a task to run at 12:00am every day. Change the paths and service name to sute the setup. Today’s job was to configure a daily backup of our Cisco routers configuration to an FTP server. The setup we have here are a number of Cisco ADSL routers connected to head office via a IPSEC VPNs. The good news is you do not need to purchase utilities or software. 1. If the router is remote to the ftp server you will most likely need to tell the router which interface to use (for us it is BVI1). 2. Create a policy-list, backup_ftp is just the name of the policy and following are the commands to run. 3. Tell the router when to run and what polices to run (5:00AM every day). I had an outstanding job to update Adobe Reader 9 on a Windows 2003 Terminal Server. 7. Patch the AIP with the latest update that came with the download package (in the Extract folder). This will allow you to make a custom install MST file to control what settings your users have in Adobe Reader. Note; setup.ini was not there when I made the AIP. You may need to modifying the extract folder msi then copy it. Note; Add double quotes if you have problems. Hope it helps someone, let me know if you have any comments or fixes. Today I was asked to block our Outlook Read Receipt group policy from applying to a single user account when logged onto our Terminal Server. Currently there is a group policy that sets Outlook tracking options to “Always send a response” for all users. This user needed the option “Ask me before sending a response”. I received a call from one of our users about a problem opening Olympus DSS Player Pro 4 (update 4.10.4) transcription module. It was working perfectly on Windows 7 until now. When you double clicked on the shortcut to TpstWnd.exe an hourglass appeared briefly then nothing; there were no error messages. I opened task manager and could see the process running. I started to troubleshoot by checking licence key, registry entries, changing compatibility setting and finally re-installing the application but none of this worked. I then turned to sysinternals suite procmon.exe and discovered some buffer overflows errors. This led me to start checking windows updates and sure enough it turned out to be kb2670838 and the only solution was to uninstall it. Problem solved but if kb2670838 fixes something else for you then you may need to get a new version of the DSS Player Pro. We experienced an unusual fault today, it started out with remote users complaining about voice quality from their Cisco IP phone and remote desktop was dropping out. At first I thought it was a network problem as the users connect via a Cisco router IPsec VPN. While I was checking the main router, local users started complaining about voice quality, which changed my focus to the pbx (Asterisk running on Linux). I connected an IP phone directly to the pbx and voice quality as good so I moved onto the switches. I noticed port 20 was intermittently changing between amber and green so I removed the cable and all the problems disappeared. I could replicate the problem on any port so it was not the switch. 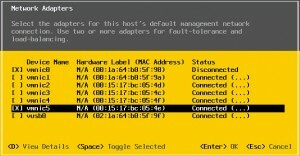 I traced the network cable back to our VMWare hosts first network adapter which is assigned to the Management Network. Now I needed remove the faulty one and assign another adapter to the management network. Here is how I did it, I hope this helps someone else. 6. I received this warning message, this did not concern me as I knew the adapter was not assigned to any guest so I pressed enter. 7. This part of the following message did concern me “In case IPv6 has been enabled or disabled this will restart you host”. I did not find this very clear, I am not using IPv6, will it restart my host? To be safe shutdown your virtual machines first. My VMWare host did not restart and all was ok.